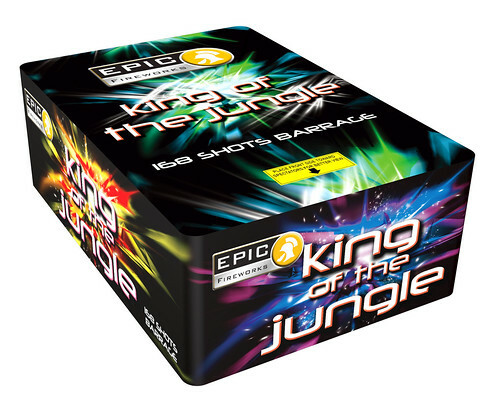 The massive 'one light' 168 shot King Of The Jungle - Crisp and clear colours and loud 1.3G breaks. This fanned barrage features peonies in silver, red, green and mixed with glittering trailed comets and spinners and then as the pace increased, the sky fills with multi-coloured breaks with strobing glitter in a sweeping fan. Simply beautiful and a brilliant addition to any display or as a standalone piece. Just over a minute in length, it is destined to be a huge hit for either Bonfire Night, New Year's Eve or indeed a celebration of any sort.